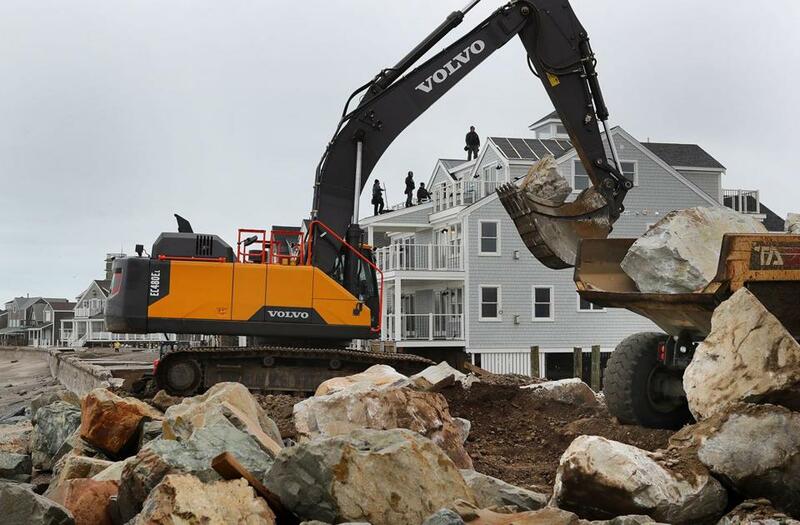 Workers rushed to rebuild a breached seawall in the Brant Rock section of Marshfield on Wednesday. Hard-hit South Shore communities again had to face down high tides in the midst of a nor’easter early Thursday, leaving some areas flooded for the second time in a week. But emergency officials in some areas were hopeful that they had avoided a repeat of the severe damage and evacuations amid the heavy winds and rain that accompanied the most recent storm. In Marshfield, Fire Chief William Hocking said he and his colleagues were watching anxiously to see whether a makeshift fix to the town’s seawall would minimize the damage. “There was a lot of storm surge, and we were afraid that the temporary repairs on the seawall would not hold, but it appears right now that they did,” Hocking said after Thursday morning’s high tide. Still, he said, there were places where the water topped the seawall, leading to floods that he estimated at up to three feet in areas including Brant Rock and Green Harbor. He said people there weren’t in danger because they had evacuated after last week’s storm. There was also a gas leak that affected more than 350 customers, Hocking said, but utility workers were in the process of restoring service. Tom DeCoste, a dispatcher for the Scituate fire department, said the department had extra staff working overnight in case there were any flooding emergencies.